Pellingmans' Saraband: Viol and lute duo. 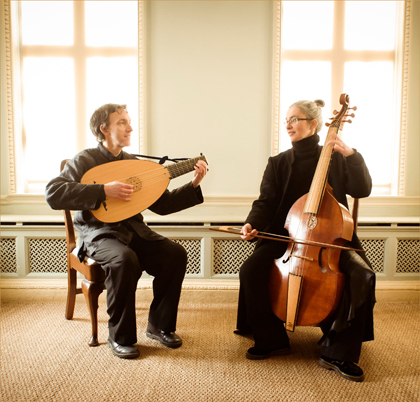 Sports football betting appJacob Heringman and Susanna Pell have been musical colleagues for almost 25 years and have both enjoyed distinguished careers at the forefront of the early music movement; Jacob as a soloist and with many prominent period ensembles; Susanna as a freelance performer and member of the pioneering groups, Fretwork and The Dufay Collective. Between them they've made around 150 recordings for major record labels (they've lost track of the exact number!) and played in many prestigious concert series and music festivals throughout the world. They can be heard on film soundtracks such as Harry Potter and the Prisoner of Azkaban, Kingdom of Heaven, The Da Vinci Code, Elizabeth: The Golden Age, and Ridley Scott's Robin Hood. Jacob appears on Joni Mitchell's 2002 release Travelogue and Susanna on Kate Bush's 2005 album Aerial. In 1999 they celebrated their marriage. Composer, Andrew Keeling, wrote a piece, Pellingmans' Saraband, to mark that occasion. Now they take that title for their new duo when, for the first time in those many years of performing separately and together, they focus on combining the unique sonorities of their two instruments in an exploration of music from the late medieval period through to the early baroque. 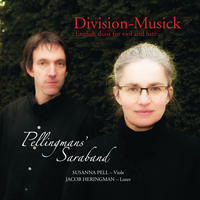 Division-Musick is Pellingmans' Saraband's first recording and signifies the launch of a new phase in their performing careers. Pellingmans' Saraband lives in Richmond, England. Tagged as: Classical, Renaissance, Instrumental, Composer: Christopher Simpson, Composer: John Dowland, Composer: John Johnson, Composer: William Byrd, Lute, Viola da Gamba.